In 30 years experience, I have realized that the elements used to teach students have a powerful impact on learning outcomes. Personal finance has always been my favorite subject to teach. I love imbuing students with the necessary knowledge for them to fulfill their financial goals. It helps them make the right choices when it comes to money. In other words, I like to provide them with the right tools to have a more prosperous future. I recognize that experiential learning is the key for students to better understand what’s taught. For 3 years now I have been having the pleasure of teaching my classes inside a Personal Financial lab. Students love the games we play in our stock market lab. The colored tickers, the big screens and all the information available, make the learning experience fun. This is different than sitting in a class, taking notes, and reading from a PowerPoint. Having this technology available is not the only benefit for students. I can say that it had made me a better teacher! Our school does not have a big budget. We were able to add an LCD screen and a ticker to our computer lab. This has completely transformed the engagement I get with my students. It’s a common misconception that teachers usually have when using this kind of learning tool. They tend to think that a finance lab is only useful if you are teaching a finance class. The scope of a finance lab goes beyond a simple finance class. A variety of subjects including math, economics, and business also use the lab. It is now part of their classes. Plus we have after-school programs and clubs using it as well. In this competitive environment, employers look for individuals that have hands-on experience. Employers want people skilled in data analytics. 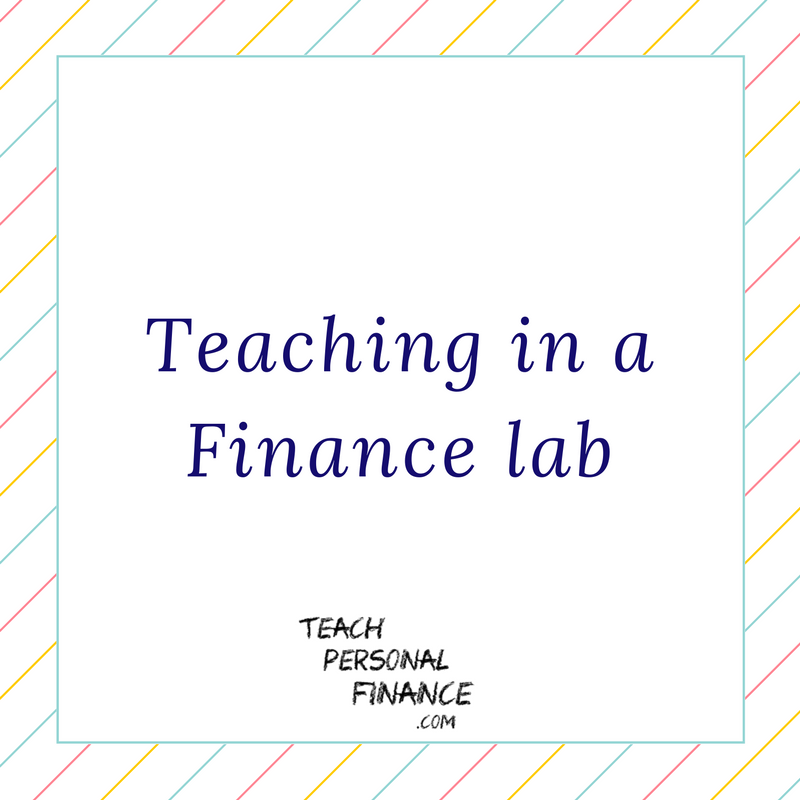 Having a finance lab allows students to put into practice the theories learned in class. We help them bridge the gap between theory and practice. The lab builds the necessary skills to be prepared for the job market. Having a personal finance lab is also a great way to attract students and funding. It can help schools build strong relationships with the business community. We were also able to get a sponsorship for our lab which helped with the installation costs. As I have mentioned before, one of the best free resources for your classes is HowTheMarketWorks, but you can bring your classes, and the whole school to a new level by adding a Personal Finance Lab. Your students will soon call it "my finance lab."